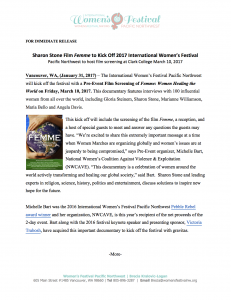 Vancouver, WA, (January 31, 2017) – The International Women’s Festival Pacific Northwest will kick off the festival with a Pre-Event Film Screening of Femme: Women Healing the World on Friday, March 10, 2017. 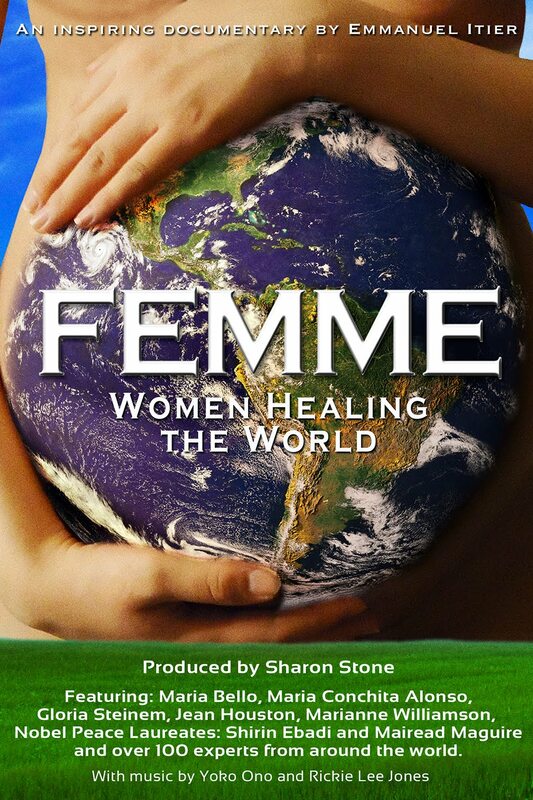 This documentary features interviews with 100 influential women from all over the world, including Gloria Steinem, Sharon Stone, Marianne Williamson, Maria Bello and Angela Davis. This kick off will include the screening of the film Femme, a reception, and a host of special guests to meet and answer any questions the guests may have. “We’re excited to share this extremely important message at a time when Women Marches are organizing globally and women’s issues are at jeopardy to being compromised,” says Pre-Event organizer, Michelle Bart, National Women’s Coalition Against Violence & Exploitation (NWCAVE). “This documentary is a celebration of women around the world actively transforming and healing our global society,” said Bart. Sharon Stone and leading experts in religion, science, history, politics and entertainment, discuss solutions to inspire new hope for the future. Michelle Bart was the 2016 International Women’s Festival Pacific Northwest Pebble Rebel award winner and her organization, NWCAVE, is this year’s recipient of the net proceeds of the 2-day event. Bart along with the 2016 festival keynote speaker and presenting sponsor, Victoria Trabosh, have acquired this important documentary to kick off the festival with gravitas. The second annual International Women’s Festival Pacific Northwest at Clark College on Saturday, March 11, 2017 will feature continental breakfast, lunch and catered treats throughout the day, five speakers sharing their stories of empowerment, interactive workshops and artisans in the vendor hall. Patty DeDominic, founding mother of The International Women’s Festivals and Obama Lifetime Achievement Award Winner will share a welcome message after the opening circle ceremony performed by a local tribe.